Come try out one of the thirty new Playaway Launchpads in the Kidz Korner at the Seymour Library! Each Launchpad has high-quality learning apps grouped together by subject area, theme, grade level and age, but with a super-easy interface that kids and their parents will like. From math to monkeys, every Launchpad is a new adventure for children from kindergarten through sixth grade. Launchpads check out for seven days and can be renewed once. 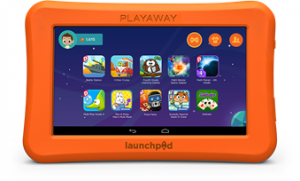 Call us at 812-522-3412, option 2, to hear more about Playaway Launchpads or any other services, classes or events at the Jackson County Public Library.